Shane, an Auburn Correctional Facility inmate with bright orange hair that clashed against his green uniform sweatpants and pullover, told the class that he wanted to study music theory in order to “express himself musically. I want to transfer onto the page what I hear in my head.” It was our first day teaching music theory and appreciation at one of New York State’s largest all-male maximum security prisons. I was a senior in college, accompanied by my fellow T.A. Claire Schmidt and a doctoral student Stuart Paul Duncan, who served as the course’s instructor. We pretended to not be surprised that a man serving a life sentence for second-degree murder wanted to compose and was already hearing melodies, struggling to bring his internal world to musical life. Shane was not the only one. A quiet, middle-aged man seated beside him expressed that he wanted to put music to his poems. Gherald, a tall, broad-shouldered man with long dreadlocks, said that he composed raps and wanted to learn how to notate rhythms. He also sang with the prison’s church choir on Sundays and hoped to improve his voice. Christopher, incarcerated since the age of 17, said he wanted to know “why music sounds good, why it works the way it does.” Michael, a Hispanic man seated alone at the end of the table, informed us that he used to teach a class on music theory. Within these few short minutes of introduction, millions of questions raced through my mind. Who are these men? Am I scared? Why am I here? Do I know why music sounds good and can I communicate an answer in a way that will be meaningful? Each of the seventeen men seated around the room looked at us with calm curiosity and a sincere respect. Their eyes were wide like a child’s discovering the world, yet their capacity for intellectual and philosophical exchange transcended that of the average student. They were a striking mix of total inexperience and naïvety, having spent the majority of their lives within the narrow confines of prison, and a source of devastating experiences, having lived in dangerous communities, witnessing horrors, and committing the terrible acts that led to incarceration. One man, presumably involved in gang violence, told me that prison had saved him. He believes that if he had not been arrested and removed from his situation, he would be dead by now. 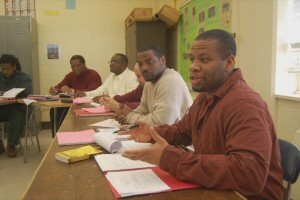 The Music Theory and Appreciation course was implemented through the Cornell Prison Education Program, allowing incarcerated men to attain an associate’s degree through Cayuga Community College. Classes offered throughout the program’s 15 years of operation include genetics, constitutional law, medical anthropology, Asian meditation, writing, theater, and economics, to name a few. Philanthropist Doris Buffet provides the crux of financial support through her Sunshine Lady Foundation. The program aims to increase an incarcerated man’s chances of reintegrating into society upon release and lessens recidivism. It enables some men to even come to terms with their own imprisonment as well as their circumstances and choices that led to their sentence. The Auburn penitentiary of the 1820s imposed constant silence during the day and solitary confinement at night. It was also the site of the first execution by electric chair in 1890. While the “Auburn System” has since been abandoned, the incarcerated men still live in a state of dehumanization. They are the first to acknowledge that they brought this life upon themselves, committing some of the most atrocious acts imaginable. My students had murdered their lovers, even their children. They had raped women and led violent gangs. The least offensive of their crimes was armed robbery. I knew this because all of their records were accessible online. At Cornell’s training session, program leaders told us over and over again “Do NOT Google your students! You will not like what you see.” I did it anyway. I needed to know. At home, reading of their crimes, I would feel sickened. Walking through the prison to my class, I felt scared, even though a guard escorted me through the halls and showed me which handle to pull in case of emergency. Yet the moment I arrived in the classroom, these men transformed into my students. Despite their crimes, I grew to care for them as fellow human beings whom I hoped would grow and change. They were no longer nameless men in green with an identifying number but real, emotional, articulate individuals who taught me as much about music as I taught them. I sat next to them, separated only by a desk, while they told me about the music they loved and revealed their artistic aspirations. When Claire and I moved about the room, the men would make way and always ensure we had enough space. They did everything they possibly could to make us feel at ease. They understood how they were viewed in the eyes of society and cherished the feeling of normalcy and respect created within the classroom. I soon became accustomed to the hour of security checks that preceded each visit and the routine of waiting for the guards to lock one door before crossing the room to open another. As the semester unfolded, I was strangely no longer afraid, not even when walking through the prison yard as the men huddled in groups and stared at me. I was baffled and intrigued. Their whole world was gray concrete: not even a stray weed could grow through the cement. Just this small glimpse of prison life stood in stark contrast to the vibrant atmosphere engendered within the classroom. Instead of feeling fear, I felt inspired by the resilience and determination of my students to be the best that they could possibly be. I anticipated that the severe circumstances of prison would color all aspects of the classroom experience, but to my surprise, the room felt like a safe haven, a comfortable space where ideas could flow freely. It was the purest form of education I have ever experienced. Imagine a class where every student feels it is a privilege to learn, yearns to participate and be heard, and absorbs all of the material with passionate curiosity. Imagine a music class where every piece is fresh to the ear and observations are not bound to a preconceived notion of what makes classical art. Within the nightmare of incarceration flourished the dream of education, an unabashed, provocative insight into musical meaning and expression. My favorite student was Shane, who did ultimately learn how to write down his own compositions. The students regarded Shane as a leader in the classroom, a role that Shane never experienced in the prison as an openly gay man struggling to survive. Shane’s partner, also an inmate, was attacked by fellow prisoners and transferred to Sing Sing for his safety. Shane’s 1996 trial was well publicized: his was the first death penalty case brought by a New York City prosecutor following the reinstatement of capital punishment in 1995. Controversy surrounded the possibility of a death sentence in the trial of a gay man when the murder was not pre-meditated. After years of appeals, Shane received a natural life sentence. Just like Shane, most of these men only experienced life outside of prison walls until their early twenties. I was twenty-one, but they thought I knew everything. They were visibly disappointed when I could not answer a question, questions such as: “Why does music have meaning?” “Why do different people like different kinds of music?” “How does music communicate?” They knew that these were difficult questions, but they genuinely believed that an answer could be reached. With each insistence that I try to explain, my students challenged me to examine my artistic identity, what was behind my drive and desire to become a composer. I would stare at their eyes as they implored me to demystify an art form that people spend their lives trying to understand. Every lesson, I would have to confront myself again and again, admitting that I do not have an answer. In response, their insights would guide me in ways I could have never expected. I hope to share through my remaining posts what I learned about myself as a composer and musician during my three short months as one of Auburn Correctional Facility’s music teachers. I arrived wondering why a group of prisoners would voluntarily take a class on music theory when my freshmen class hated the topic. I feared that they would feel disconnected from classical music, particularly contemporary music, and wondered if we would find common ground. Over time, they shared with me their thoughts on Steve Reich, on Purcell and Rachmaninoff, on Benjamin Britten and Messiaen, and during the last class, they told me their thoughts on my own compositions. I will never know if I changed their lives, but I do know that they changed mine. Inspiration comes from unexpected sources. I learned that if you want to be an artist, it is imperative to reach beyond your comfort zone, to explore your wildest dreams and engage your deepest fears. Push yourself as a writer, a creator, and as a person to connect with the world outside of yourself. Dig through uncomfortable material and unknown territories until you see the stalk of green striving through the crack in the cement.